You can add the Apache Superset service, which is installed by default with HDP 3.0, to your cluster in Apache Ambari. In this task, you use a wizard for customizing Superset services that includes configuring a database backend that Superset uses to store metadata, such as dashboard definitions. By default, SQLite is installed for use as the metastore in nonproduction situations. SQLite is not a client/server SQL database. For production use, you must install a suitable database. For example purposes, in this task, you accept the default SQLite database. You configure a SECRET_KEY to encrypt user passwords. The key is stored in the Superset metastore. Do not change the key after setup.Upon completion of this task, you can connect Apache Hive to Superset. You have installed a client/server database, such as MySQL or PostgreSQL, to use as the Superset database for storing metadata. 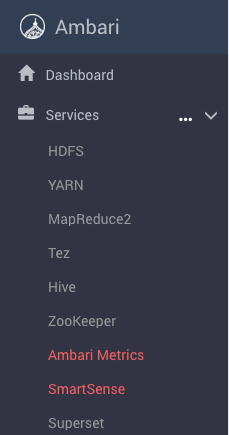 From the Ambari navigation pane, select Services, scroll down the list of services to Superset, and click Add Service. In the Add Service wizard, scroll down to Superset, which is selected for addition, and click Next. In Assign Masters, accept the single default node selected to run the Superset service, and click Next. Superset Database Port--Enter a port number. For example, enter 8088 if you accepted the default SQLite Superset database, or 3306 if you configured MySQL as the Superset database. Superset SECRET_KEY--Provide any random number in SECRET_KEY, accept the other default settings, and scroll to the bottom of the page. Attention message--Click Show All Properties and follow prompts to configure any properties, such as providing a Superset Admin Password. In Customize Services, in Advanced, enter a Superset Admin password. Click Next, and in Summary, click Complete and confirm completion. Superset appears in the Ambari navigation pane.